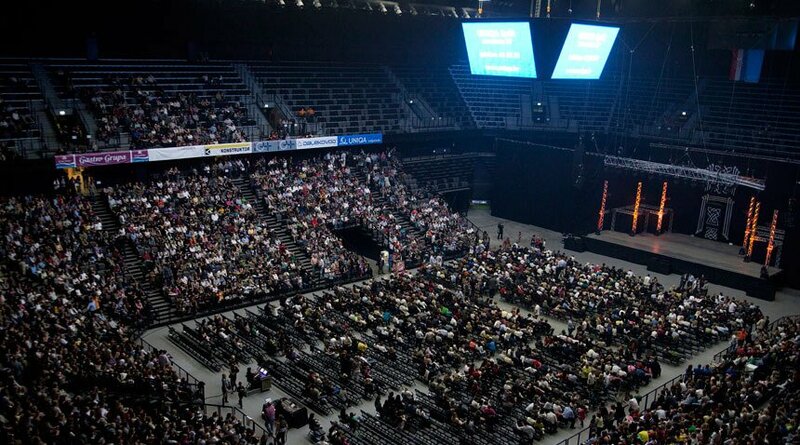 Split DMC – Best Venues & Activities for your Events. Split the eternal city, emerging from the walls of the Roman Emperor Diocletian’s massive palace, offers a wide variety of hotels, venues, shore trips and activities as well as its position as the gateway to the Dalmatian islands.This 1700 year young city nestled beneath the Hills of Marijan exudes a Mediterranean air. Its four and five star hotels, all newly constructed, draw on this natural and cultural heritage to provide guests with a truly regal experience. International hotel chains are just beginning to discover this burgeoning destination, teaming with local owners to establish expected industry standards while allowing local charm and character to prevail. Majority of hotels are sea side and have their own jetties allowing for access by sea. This can be capitalized upon as a gateway to the nearby islands or as an alternative to a coach transfer from the hotel. Can you image a better way to start off a program?A fantastic mix of ancient and modern, Split offers a diversity of venues suitable for every taste. Venues within Diocletian’s palace include his cellars, an exact layout of his palace, can be privatized and are ideal for themed evenings which can include gladiators and a visit form the Emperor himself. As a Dalmatian cultural and entertainment center, the city boasts many contemporary locations available for all event needs. 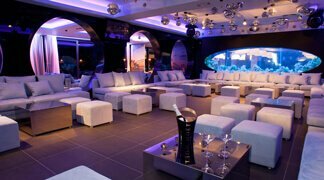 From Modernist palaces with their elegant and clean lines, to hip lounge clubs, Split really has it all. A wonderful counterpart to the activities available in the city itself, Split, boarded by rivers to the north and south and sheltered by islands to the west, can provide any number nature oriented activities. City hunts, themed activities, rafting, cannoning, biking, sailing, national park visits, culinary experiences, just to name a few, are all accessible within only a short transfer via land or sea. Weather brave at heart of culturally oriented Split offers something for every taste. Enjoying a private guided tour of Split city center is probably the best way to get to know this dynamic city that has evolved over the centuries from the Roman Emperor Diocletian’s summer Palace to the now bustling city that it is today. This city has the perfect blend of history and modern influences, its considered theheart of Split for not just visitors but for locals as well. It’s not merely museums and historic buildings, its restaurants, shops, an abundant green market, the famous „Riva“ for coffee at a cafe, its rubbing the foot of Grgur Ninski for good luck; its friendly people.A relaxing afternoon visit to the town of Trogir is definitely not to be missed. Just 30km from Split, Trogir with its concentration of palaces, churches, towers and fortresses on a small island in every way deserves its nickname “THE STONE BEAUTY”. A little bit further from Trogir is the National Park Krka a breathtaking park with cascading waterfalls, hiking paths and a Dalmatian Handicraft village. After visiting Krka we suggest a stop at Etnoland – a perfect place to get a glimpse into the traditional heritage of the Split Region. One of the most popular on the whole coast is the Island Hvar, only 1 hour by catamaran from Split, is the sunniest Dalmatian island and famous for its lavender fields. Constantly founding itself on lists of best Islands in the Mediterranean. Not at all a surprise to the inhabitants since it has so much to offer including Island drives with vintage beetle convertibles, jeep tours, sailing to the nearby Pakleni islands, wineries and top notch restaurants. 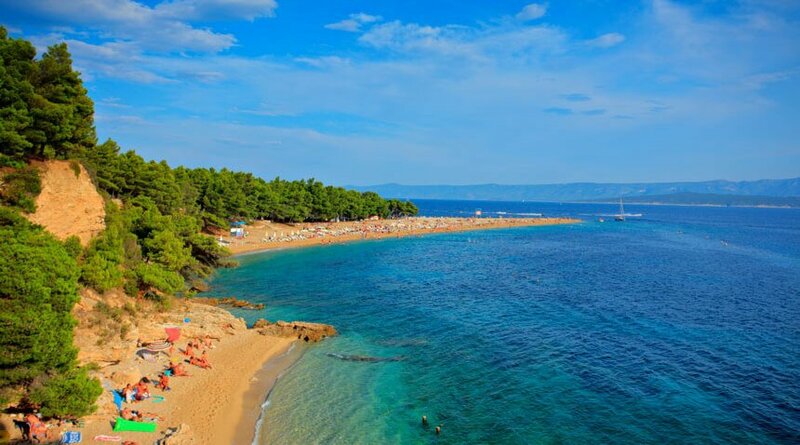 Island Brač, one of the largest island in Croatia, where the famous Brač limestone originates, offers not only a beautiful seaside areas but a variety of active programs including hiking to the highest peak of the island with spectacular views, bicycle tours or sailing and kite surfing. If you are looking for a more off the beaten path Island, Šolta is the perfect spot. Known as the „Olive Oil“ Island a short speedboat or ferry ride will take to the island where groups can visit olive groves & production facilities and taste a variety of olive oils. 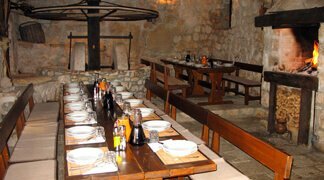 Groups looking to hold an offsite meeting can be pleased to know that on Šolta a restored Castle that is now a boutique hotel has modern meeting facilities as well as a spectacular restaurant. 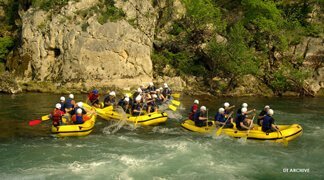 Split offers a variety of outdoor activities including rafting, canoe safari on the Cetina River or an off road Jeep Adventure on the mountain range above the Cetina Canyon, ending at a casual riverside restaurant for lunch. 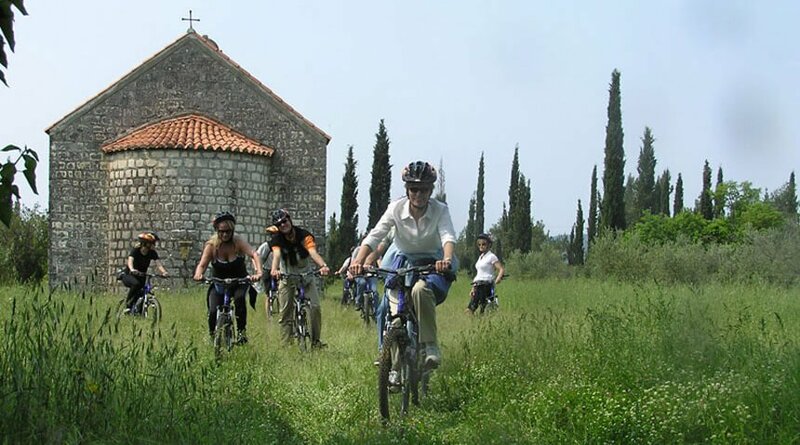 A biking tour around the Split city center is another great way to explore the city in a more interactive way, while the Segway tour allows both cultural experience and fun. The People of Split, among other things, are probably most proud of their sun and beautiful crystal blue sea. Due to its perfect climate and position Split has become a mecca for sailing regatta’s and other water activities including kayaking, jet ski safaris and scuba diving. A memorable kayaking tour can be organized from the town of Trogir to end in a historic water mill where groups can enjoy a traditional lunch. Go ‘treasure hunting’ while exploring the city, find locations and take pictures during ‘old town challenge’, deactivate ticking bomb in ‘James Bond’ or escape from everyday stress while playing ‘paintball’ are just some of the team building activities that can be offered. 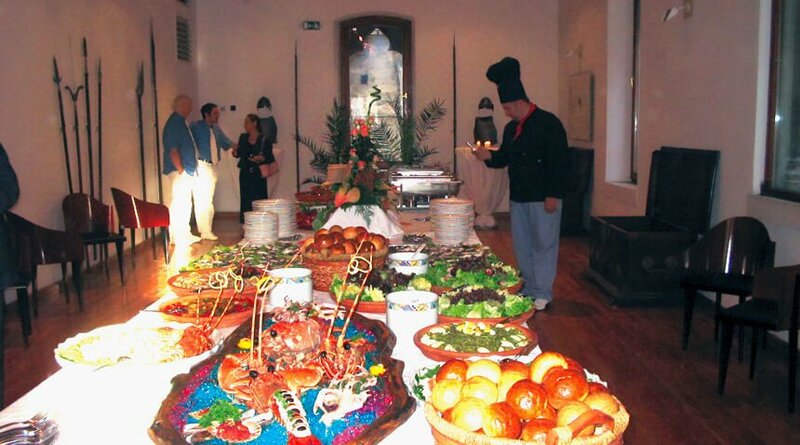 Looking for something more special allow us to create an a la carte teambuilding program just for your group integrating the key points and goals of the company. For groups that want to enjoy and learn something at the same time a varieties of activities are available. Making cocktails – Learn to make the famous Cocktail , this unique Croatian cocktail uses only local ingredients including liquor of the maraschino cherry and candied oranges to add a touch of sweetness. Split, the center of Dalmatia is equally ideal for events held on the land or on the sea. 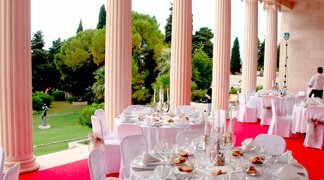 Rich evening programs with gala setup can be arranged at alluring Venues in Split within the very core of Spit town – Diocletian’s Palace. During the warm summer nights open air programs on one of the Split’s squares combined with an after dinner surprise performance in the streets provide memorable experience. 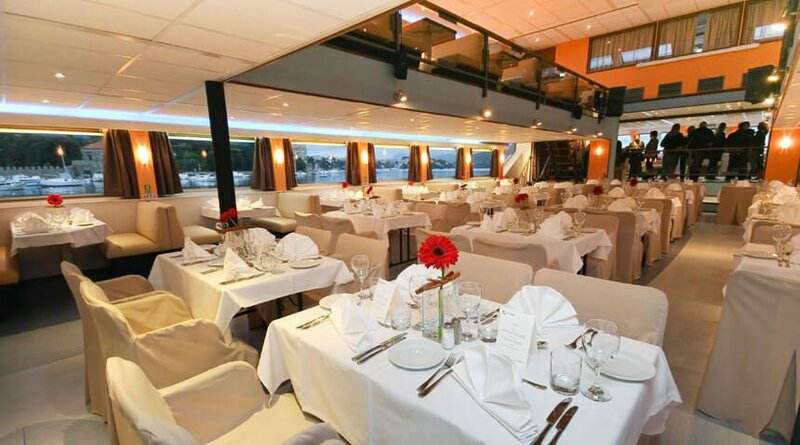 Evening on the ship, as one of the options, with special setting and cool entertainment, cruising in front of Split and around its islands is a proven and fantastic group solution. City center restaurants located in the city center are very true to ambiance with stone interiors often confused with the Doicletian’s Palace! The menus tend to be a mix between Croatian and Italian cuisine featuring a combination of both modern and rustic. 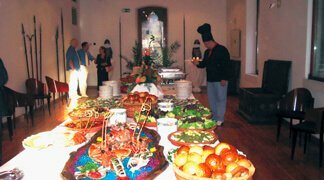 Traditional– Restaurants encompassing a range of Croatian cuisine with rich, traditional, old fashioned homemade meals. Bolster the traditional feeling by adding a typical Dalmatian Trio singing songs and playing guitars and mandolins or traditional Dalmatian ”Klapa” singing ”a capella“ and experience all that is Croatia. With a cuisine that encompasses all of the Mediterranean’s charm and a wine list to impress, those restaurants will certainly provide memerable experiences. 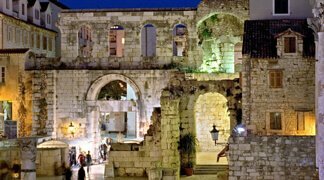 Split, a 1700 year old city by the sea where the Roman Emperor Diocletian built his palace – today a UNESCO World Heritage site offers you numerous historical venues that can be used for various Events. Palaces– The Unique Split center , has risen on the foundation of the summer villa of the Emperor Diocletian built in 305. Although 17 centuries of undisturbed life within the walls has resulted in many special works such as the Emperor’s mausoleum and the cathedral of St. Duje. 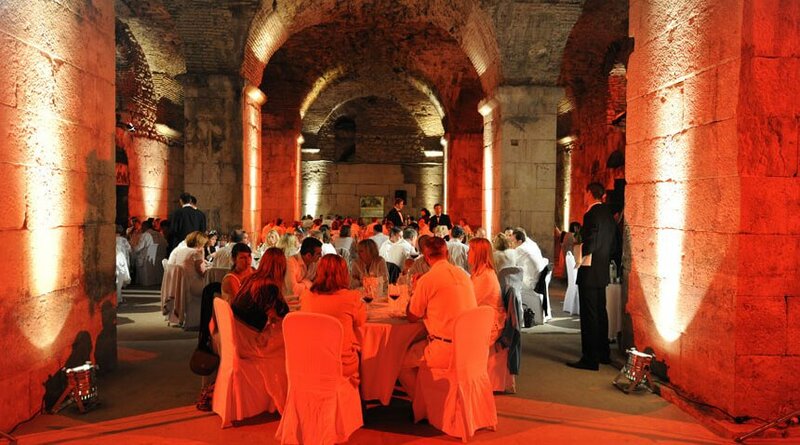 Gala dinners, tastings, concerts or just a meeting with „the emperor“ can all be arranged withing the Diocletian’s Palace. Villas– Enjoy a private dinner in the Villa of former Yugoslav President Tito. The Villa, which has recently been renovated, is situated on the sea, in a private bay, featureas a luxuirious terrace and unforgettable views. 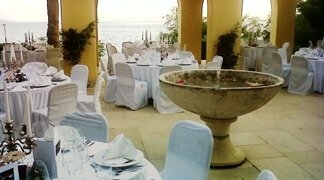 Do not miss the sunset or a gala dinner on the terrace of this presidential Villa. Museums– Split has a long tradition of collecting and caring for monuments. This interest appeared as early as the Renaissance. 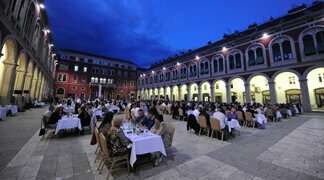 Be a part of the cultural heritage of Split by enjoying an evening in one of many venues around the city. The City Museum of Split for example is located in the northeastern part of Diocletian’s palace, within the complex of Medieval buildinqs at whose center is the Gothic palace of the Papalic family designed and built by the native master Juraj of Dalmatia and his stonecarvers and builders circle. Beautifully excuted are the courtyard with its richly decorated portal and loggia, the first floor hall with its lavish four-light, two-light and one-light windows and with the well preserved wooden ceiling. 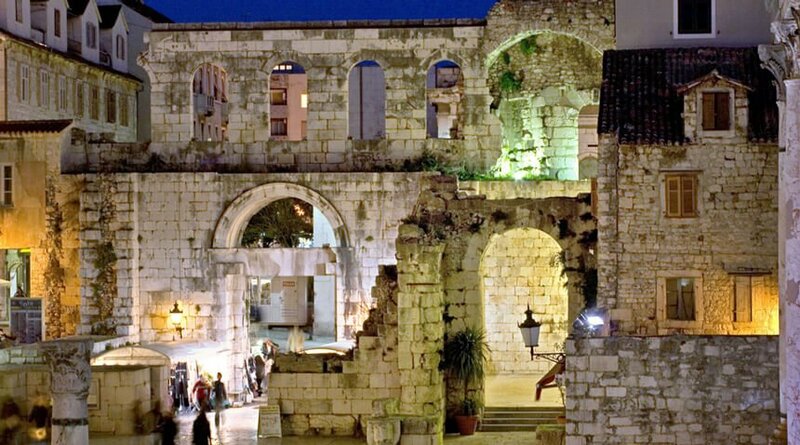 Open Air Venues– Many squares in Split atract tourists from all over the world. Enjoy drinks on Peristil square, tasting on Vestibul square or gala dinner on the famous square in the middle of the city of Split – Prokurative, officially the Republic Square. Located along the western walls of Diocletian’s Palace Prokurative are the square with neo-Renaissance buildings and overlooking the sea. In the summer months parts of the Split summer festival, concerts and shows take place there. Galleries – Because of its location and Mediterranean way of life, Split was an interesting point for many artists. Works of art are covering the period from 14 century to the present days and giving an overview of all the major artistic trends in this area. Among them the most significant is Mestrovic gallery with its multifunctional sea view garden that can be used for cocktails, catered dinner or other events. 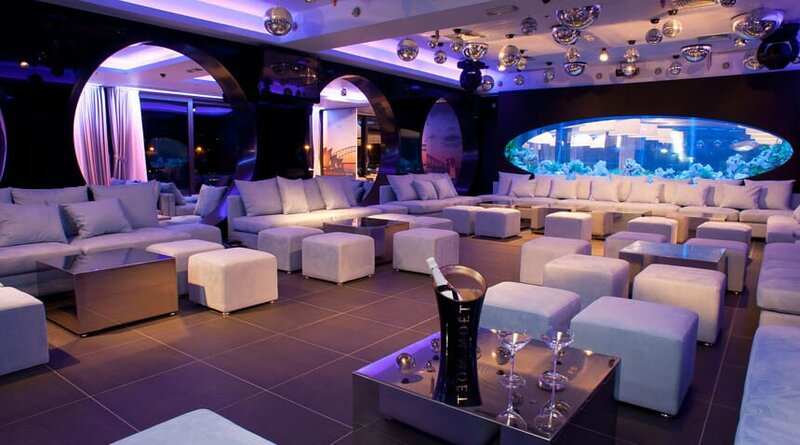 Lounge Bars – Presentations, celebrations, regular or gala dinner, after party, cocktail trainings… are just a short list of possibilities in various bars and clubs in Split. A Modern Event boats, as well as historic replicas, yachts and traditional dalmatian wooden boats are all perfect ways for groups to enjoy the Adriatic Sea. With the nearby islands groups can sail off to the Islands and explore or enjoy a cocktail cruise or dinner while sailing past the Old City of Split. 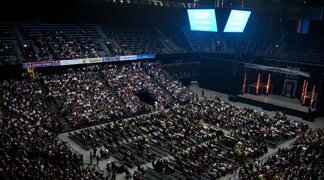 Split’s meeting venues are mostly found within hotels. Highly equipped meeting areas are designed to equally satisfy both small and large group requirements. However, planners looking for tailor made meeting solutions can find special meeting venue alternatives within the walls of historical venues and galleries or modern halls, providing different ambience with all commodities of standard meeting venue.